There is something about the beautiful sunsets that attract everyone and we all look for places to visit, where we can have a sight of the most romantic sunsets. According to the psychologists viewing sunsets helps to boost well-being, increase generosity and enhance life satisfaction. Moreover, it has been found out that there had been 286 million images of sunsets were uploaded to Instagram over the last year. Therefore the inclination of travellers towards sunsets is so much that they prefer to travel to places with the most beautiful sunsets in the world. All shades of oranges, red and yellow make the whole sky magical and as it is said there is no same sunset everywhere, you have to travel to see the best ones. So to be the spectator of the most beautiful and romantic sunsets in the world, here we have found out places where travellers will definitely enjoy the mother nature’s magic in the sky. Paris the city of fashion attracts tourists throughout the year, apart from the Eiffel tower and luxury shopping hub, Paris also has many serene locations where one can have the sights of most amazing views. 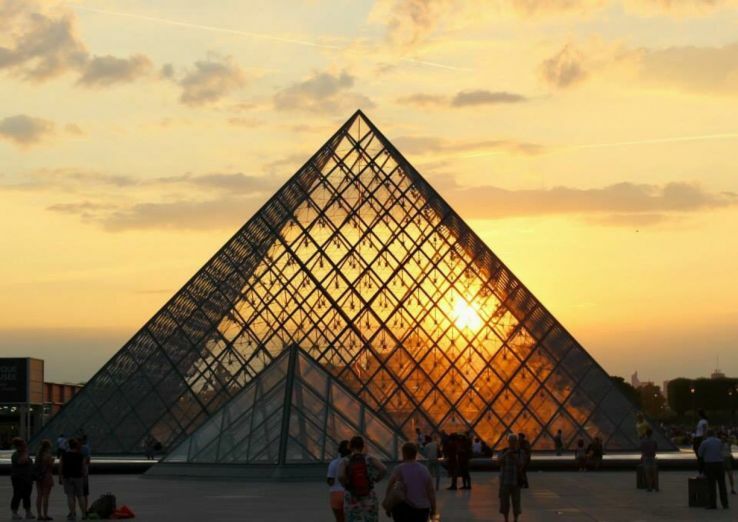 The perfect location to enjoy the sunset in Paris is near the Louvre Museum, it's here when the sun reflects through the prism dome of the museum, giving the most beautiful views of the sunset. So if you are on a romantic date or on a honeymoon in Paris, don’t forget to enjoy the most romantic sunset in Paris with your beloved. Agra, the city of love popularly known for the UNESCO world heritage site Taj Mahal, which is known for being the epitome of love. Then how can you miss the most romantic sunset in the world by not visiting here? The many sides of the Taj Mahal come out so beautiful in the pictures during the sunset time. The whole colors in the sky and the white marble structure shining brightly in the middle will make you fall in love with the place there only. So don’t forget to be the spectator of the sunset in Agra and enjoy the beauty of Taj Mahal when the sun is setting. Though not just the sunset Taj Mahal has its own charm in full moonlight too, so if you ever get the chance to visit during full moon night, don’t ever miss out on that. 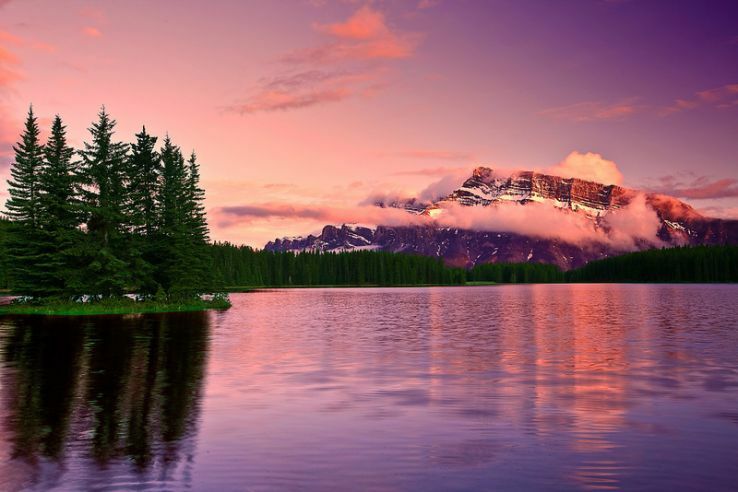 Banff is a resort town located in the Banff National Park, is Canada’s most awe-inspiring mountain destination. It's here you can enjoy the pristine wilderness and endless outdoor adventure. So set up the camp and gaze the sunset with all magical colors in the sky with millions of shades drowning through the mountain. The beautiful city Surin is located in the Northeast of Thailand is known for the famous Elephant festival, which attracts tourists from around the world. Apart from that natural beauty and pristine beaches of this city makes it the most preferred destination to enjoy the most romantic sunsets in the world. 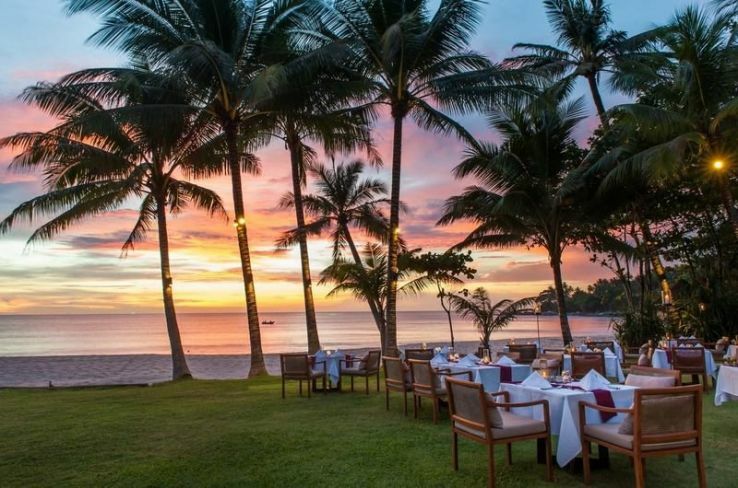 So sit under the palm trees, love the vast ocean as the sun sets over water in Thailand. 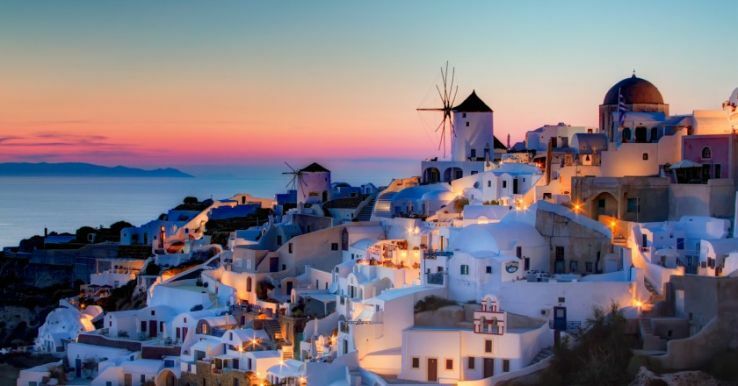 Santorini is considered to be as the most sought romantic getaway in Greece, famous for its most romantic sunset in the world, Santorini is also becoming a favorite wedding destination for the couples. Whosoever has once seen the picture of Santorini can’t resist themselves from falling in love with that place. And when the sun sets over water in Santorini it becomes all the more beautiful, it makes the whole place turn purple, red, yellow and orange. So enjoy your romantic getaway with most serene views. 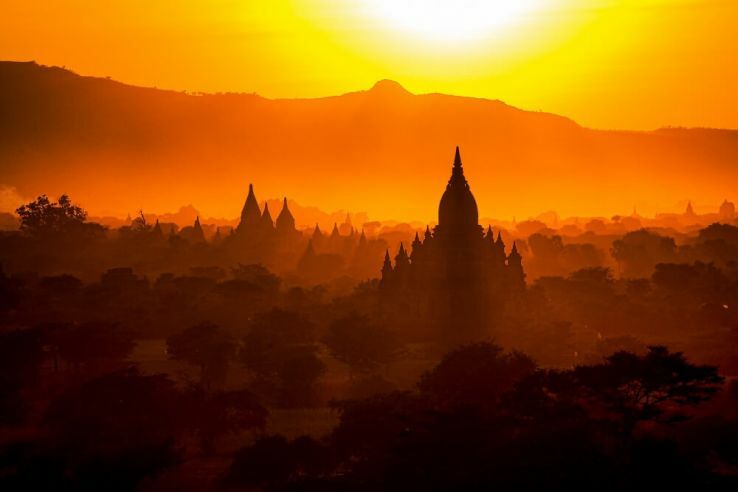 Bagan the temple town in Myanmar is one of the main attractions, the ancient city has dozens of temples and pagodas, where you can enjoy the most romantic sunset as the sun slowly sinks below the horizon and the shades of colors and scenes they create are breathtaking.